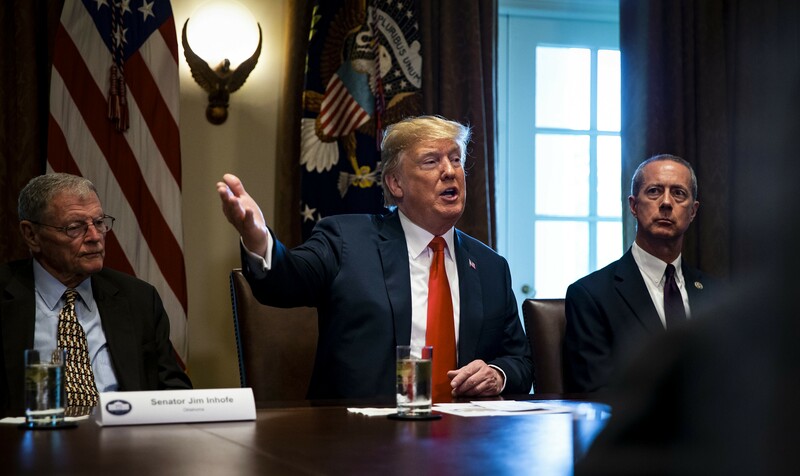 President Donald Trump speaks during a meeting with Republican lawmakers about immigration, in the Cabinet Room, of the White House, in Washington, June 20, 2018. President Donald Trump caved to enormous political pressure on Wednesday and signed an executive order that ends the separation of families by indefinitely detaining parents and children together at the border. The order said that officials will continue to criminally prosecute everyone who crosses the border illegally, but will seek to find or build facilities that can hold families — parents and children together — instead of separating them while their legal cases are considered by the courts. Trump’s executive order directed the government’s lawyers to ask for a modification of an existing 1997 consent decree, known as the Flores settlement, that currently prohibits the federal government from keeping children in immigration detention — even if they are with their parents — for more than 20 days. But it is unclear whether the court will agree to that request. If not, the president is likely to face an immediate legal challenge from immigration activists on behalf of families that are detained in makeshift facilities. Trump has for weeks refused to simply end his government’s “zero tolerance” policy that led to the separation of more than 2,300 children from their parents, saying that the alternative would be to fling open the nation’s borders and allow immigrants who cross the border illegally to remain in the country. Flanked by Vice President Mike Pence and Kirstjen Nielsen, the secretary of homeland security, Trump vowed not to relent in his administration’s prosecution of people trying to enter the United States illegally.